Up to 18 people have been killed in violence in the central Iraqi cities of Balad, Baquba and Baghdad, including as many as 11 in a US raid. 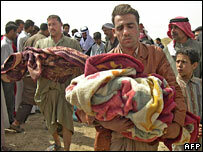 Iraqi police said 11 people, including several women and children, died in the raid. The US said only four died, though photos showed seven bodies. Meanwhile a suicide bomber on a bike killed two civilians in Baquba and a policeman was killed there by a bomb. In Baghdad, gunmen shot dead two Shia pilgrims, and a bomb killed a civilian. The violence comes a day before the inauguration of the new Iraqi parliament, the Council of Representatives, for which elections were held in December. Negotiations on the make-up of the new government are under way, but politicians are still sharply divided, particularly over who should be prime minister. The choice of the Shia-led United Iraqi Alliance to nominate Prime Minister Ibrahim al-Jaafari sparked opposition from Sunni Arabs, Kurds and secular leaders. The capital will be put under a vehicle curfew from 2000 (1700 GMT) on Wednesday until 1600 (1300 GMT) on Thursday to try to prevent the opening of parliament being marred by violence. But the high security did not prevent the killing of two Shia pilgrims on the city's outskirts, as they walked towards the holy city of Karbala. Another pilgrim was killed on Tuesday. Tens of thousands of Shias are currently walking from Baghdad to the southern city to commemorate the 40th day after the martyrdom of Imam Hussein. There were conflicting reports coming from the nearby city of Balad, after the US military launched a raid on a house where it suspected members of al-Qaeda were hiding. The US said two women, a child and an insurgent were killed. "Troops were engaged by enemy fire as they approached the building, coalition forces returned fire utilising both air and ground assets," US spokesman Major Tim Keefe said. However, a local police officer, who declined to be named, said: "They attacked the house of Fayez Khairat Khalaf Turfa, and they killed 11 people, among them five women, two men, four children, before they dynamited the house and burned three cars." However, an AFP photographer saw local people laying out the dusty and broken bodies of their dead relatives, before a burial ceremony. His photo showed at least seven bodies, five of them children. In Baquba, the suicide bomber blew himself up as he cycled up a small alley in the central Amin neighbourhood. Police said they believed the explosives had been detonated prematurely and that the bomber had planned to attack the busy main road into which the alley led. Nevertheless, two civilians were killed and six others were wounded, including a woman and two children. Baquba and its surroundings have often been the scene of violence.